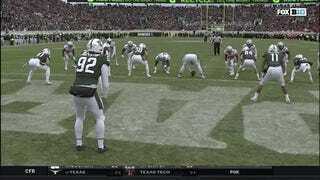 In the final minute of the third quarter, down 7-6, Michigan State intentionally took a safety on fourth down in what was likely a decision to try and give Ohio State worse field position on the ensuing punt than what one kicked from the one-yard line would yield. The Spartans followed up that supposed moment of tactical brilliance by kicking the ball out of bounds on the safety punt, giving the Buckeyes excellent field position anyways on the 50-yard line. But, because this was still a Big Ten football game, Ohio State was unable to do anything with the field position was forced to punt the ball after a three-and-out. The Spartans were pinned down at their own two-yard line and with the first play of their new drive, they decided to gift the Buckeyes a chance to extend their lead even further. There’s a reason intentional safeties are usually saved for the winning team to use in the final seconds of a game instead of when Michigan State chose to do it. Good work, Dantonio.